Arugula- Hooray for fresh greens in the wintertime! Arugula is packed with folic acid vitamin A, and vitamin C to keep you going during the grey Oregon winter. We harvested these bunches from our greenhouse and can’t wait to eat them on sandwiches, as pesto, with pasta, and as the start to an amazing salad! Believe it or not, its just warm enough (along with some potential sun and wind) that the Arugula may want to wilt slightly. Winter leafy greens from greenhouses are VERY sensitive to external conditions once they’re cut and can desiccate incredibly quickly- sometimes even faster than in the summer months. We hope this will not be the case but if you do find that your Arugula is in need of some extra perk, rinse it with cool water, shake off the excess, and wrap in a plastic bag before refrigerating. By the next day they’ll be perky and delicious! Beets, Gold– We trialled the exact same variety of this open-pollinated beet side-by-side from three different seed companies and found that the crop from Wild Garden Seed down in Philomath was superior. We are finding through yield records and field observations that the diligent breeding, careful selection, and local adaptation to Pacific Northwest growing conditions that our local seed companies can provide out performs larger companies more often than not. 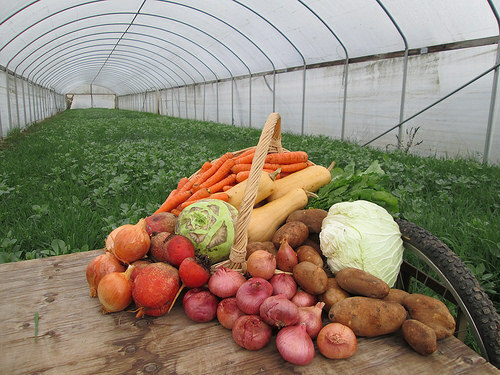 We are happy to source a large amount of our seed from the good folks down at WGS…now thats local, from seed to plate! Did we mention that gold beets are one of the sweetest types of beet, and will not bleed all over your kitchen or other foods? We love a few gold beets thrown in the juicer with YaYa carrots, lemon, apple, and ginger for a flavor and nutritional boost. Cabbage, Daedon- Another variety specifically bred to withstand cold temperatures and long term storage that we had to rush out and harvest due to excessively high late season temperatures and growth rates! The outer wrapper leaves normally turn a rich reddish-purple color with cold weather, but not this year. We saw a slight blush of red, but alas it was lost when we peeled them for pack out. This variety looks slightly savoyed, but treat it just like a regular green cabbage. Onions, Copra- You may notice that the tops around the necks are somewhat sunken- this is due to the onion losing some moisture through the neck in storage. We are trialing several new storage techniques to try and resolve this issue, but they are still fantastic onions. Just trim the tops as usual and the rest of the flesh will be juicy and flavorful. Potato, Canela Russet- Cured Russets deepen in potato flavor and become drier and fluffier. Do not be surprised if the potatoes feel be a bit softer then you are used to. This variety softens a little in storage. They may also have a few spots on their surface that can be easily removed with a paring knife.